On a Friday night after hanging out with his straight mates, Russell heads out to a nightclub, alone and on the pull. Just before closing time he picks up Glen. Over the next 48 hours, Russell and Glen become inseparable, gradually forming a tight bond that neither of them could have predicted – one that may change their lives forever. Andrew Haigh's Weekend has proved something of a critical favourite over recent months and figured on a good few Best of the Year lists, including the one by Outsider writer L.K. Weston. As stated by Timothy E. RAW in his Outsider review, "Weekend is already turning out to be the little British film that could and if Academy Awards were handed out on the basis of review aggregate, it would be one of this year's surefire frontrunners in many of the major categories alongside predictably obvious entrants The Help, The Artist and My Week with Marilyn." It's been nominated and won a number of gongs, incuding British Independent Film Awards for Best Achievement in Production and Most Promising Newcomer for actor Tom Cullen, who co-stars with Chris New and Laura Freeman. 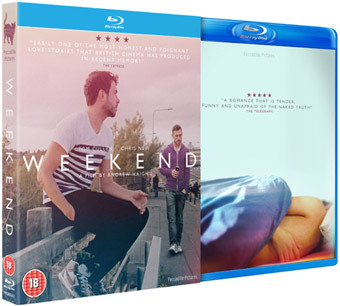 Weekend has been announced for a UK DVD and Limited Edition Blu-ray release from Peccadillo Pictures Ltd on 19th March 2012 at a to be confimed RRP.